Les Bock has finally retired as our Archivist after many years in the position. The Archive is in the process of being transferred to our new Archivist, Barry Chandler, and we'd like to thank Les for his untold years of service. Alex Kent (3d Bristol) won the 44th Wessex tournament in Bath. He beat another Bristol player - Simon Shiu (2d) - in the last round. Also winning all three games were Chris Volk (3k Reading) and James Lepoittevin (21k Bristol). 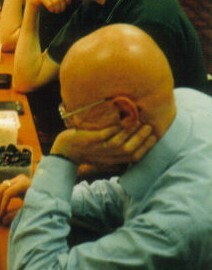 Paul Atwell has been involved in organising the event for 44 years and managed to be one of the 36 players as well this year, but was not one of the prize-winners. The first two games of this year's three game Championship Title Match, between Andrew Kay (2012 Champion) and Andrew Simons (Challenger) will be on Saturday 16 November and Saturday 23 November in Milton Keynes. Tim Hunt will be the Referee. from 11:00 on 23 November with commentary by Guo Juan 5p. After a successful start to the season last month against Greece, our UK team played Switzerland in round 2 of the European Team Championship on Tuesday. Switzerland are one of the toughest teams in our league, but our strongest players stepped up and we managed to secure a great 3-1 victory, including a half-point win by Des Cann on board 2. All profit goes to the BGA. British Go Journal 161 is now available publicly and 165 is now available to BGA members online as well as in print. 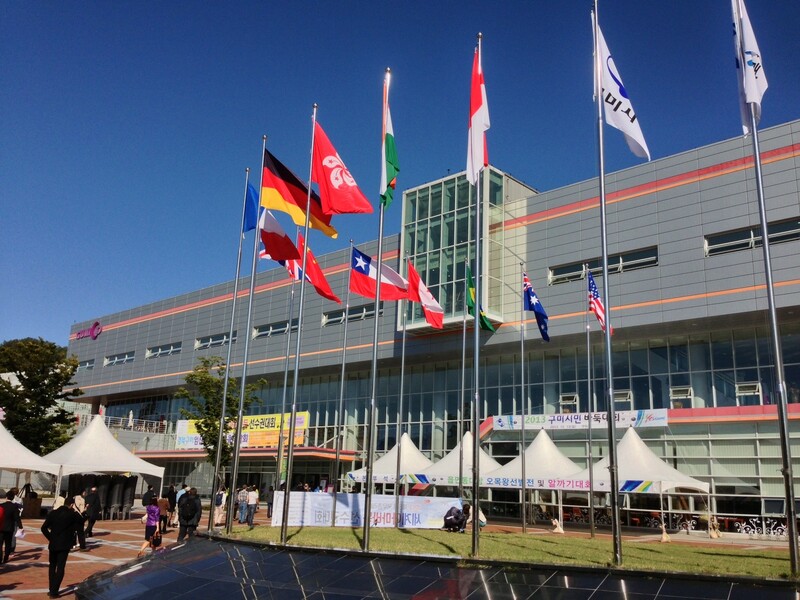 The 8th Korean Prime Ministers Cup, organised by the Korean Amateur Baduk Association, was held in Gumi Conference Centre, in an industrial city about four hours South East of Seoul. The weather was lovely (about 22 degrees), but sadly the sun was shining outside on the UK flag being flown upside down, possibly indicating distress at the UK's likely results? The opening ceremony featured magic acts making women, flowers and birds disappear and then appear again, and also strange modern Korean dancing. There were three games on the first day, with above the bar China, Japan, Hong Kong, USA, Finland (Juri Kuronen) and Czechia (Ondrej Silt) winning all three. Ilja Shikshin of Russia unfortunately got Hong Kong in the first round. Though the number of attendees was down, the players at the East Midlands Tournament liked the new venue of the Thorpe Astley Community Centre. This is a new wood-clad building in a suburb to the west of Leicester, just in the shadow of Leicester Forest East motorway services. Despite the pouring rain, you could watch the dog-walkers in the surrounding playing fields through the glass wall. The return of the bookshop was appreciated by the players, and the organiser's thanks go to Roger Huyshe. Also the players' thanks go to the organiser, Peter Fisher, for organising efficiently and getting the prize-giving ready 45 minutes earlier than planned. The winner's prize went to Yuanbo Zhang (4d Nottingham) and the others on three wins were Lucas Meurin (3k Birmingham), Richard Leedham-Green (4k Lincoln) and Andrew Russell (4k Birmingham). 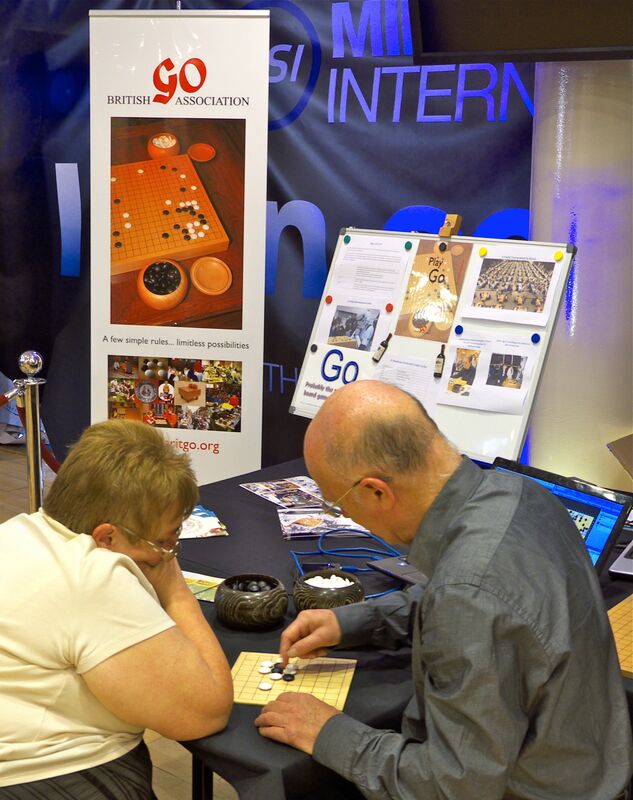 Although no Go tournament took place, Roger Huyshe ran a stand with the aim of introducing some of the 500 attendees at this event in Cardiff to Go, managing to sell four beginner’s books and three basic sets as well as putting eight or nine people in touch with their nearest club and playing trial games with half a dozen. This was also the first outing of our new roller banner - available for use by anyone who needs to market Go at an event. The most promising contact was with a couple who have Local Authority responsibility for 17 schools and are interested in setting up School Chess and Go clubs. Also helping staff the stand were our Membership Secretary Paul Barnard, Welsh Champion Dylan Carter and, from the Cardiff Go Club, Neil Greenwood, Keiran Grayson and Club Secretary Neil Moffatt. The latest two sets of minutes are now available to be viewed by members here and here.